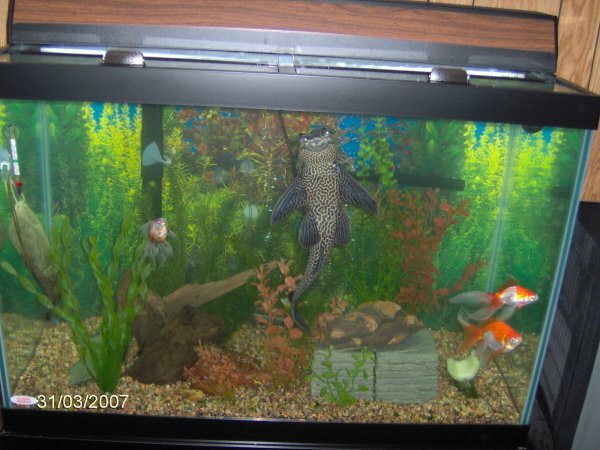 On 3/18/07, I emptied the 40 gallon tank and set it up in the new 65 gallon tank. This tank was easier to deal with because there are only four fish (albeit big ones!) and no live plants. Earlier in the day, I had removed the fake plants, rocks, etc. to be soaked in dilute bleach. Later, I then soaked them again in fresh water with dechlorinator. Photo - 40 gallon tank the day before on 3/17/07 before I worked on it. I did not do a water change that day so it was cloudy. 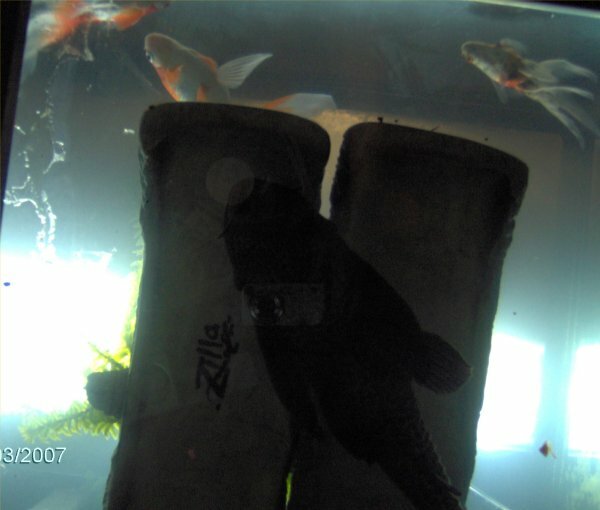 From left to right are Plecy the pleco and the three fantails, Frodo, Legolas, and Aragorn. 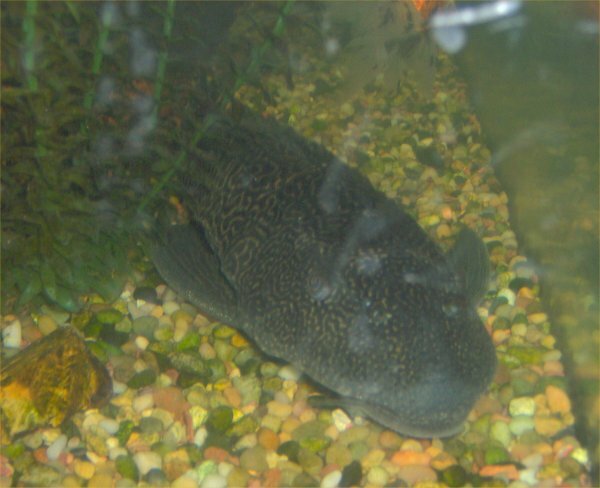 Photo - close-up of Plecy and Frodo on 3/17/07. Photo - head-on view of Plecy on 3/17/07. Just as with the 50 gallon tank, I started by removing everything from the cabinet. I found some hoses I could have used a few months ago to repair the Magnum 350 (but luckily I retired that). I removed the light and glass lid and set them aside. I bailed filled some more plastic litter buckets (just rinsed from the day before, not enough time and water to bleach soak those!). I netted out the goldfish into the buckets. I removed the driftwood, slate, and the rest of the stuff in there. I tried to get Plecy to go into a bucket but he did not oblige. I finally had to net him. He splashed me really good but I got him in the bucket and managed to get him out of the net. 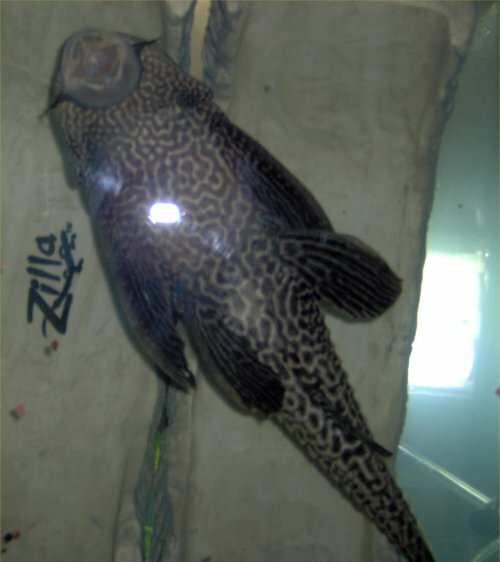 It is best to not net plecos because their fins get caught in the net. I used the Python hose to drain the rest of the tank down. I then removed the gravel and set it aside. The tank was now dirty but empty. My brother and his co-worker moved it to the floor because the stand I had ordered for it was not in yet. They brought in the new 65 gallon tank and put that down. We tried to make the edge equal all around. I then rinsed out the inside and used the turkey baster to remove the little things that were in the water. I used Windex on the outside of the tank. I hand rinsed the gravel little by little and put that back. I evened out the gravel. Photo - 65 gallon tank with just the gravel in it. I installed a new Emperor 400 as the one they had had multiple broken parts but still worked. The newer model has a mid-level intake which is a nice option but the lid does not fit (it just sits there loose, the old lid had a flow adjusted that locked into the lid). Both new filters make a bit more noise than I had hoped. I put the old biowheels into the new filter. I put in the heater. I cut new air line tubing and installed new check valves and got the aeration going. I filled the tank up halfway. Then, I put back all the non- living stuff like the driftwood, slate, new thermometer, and ornaments. I bailed back the buckets of water that did not have fish in them. Once they were in, I bailed in the buckets with fish. After all the buckets were in, I topped off the tank, filled up the filter, and plugged in the filter and heater. The water was cloudy (but not as bad as the 50 gallon). I added aquarium salt, Stress-Coat, Stress-Zyme, BZT, and later some pond AccuClear to help clear the water. I used Windex on the outside of the tank. I then cleaned and put back all the stuff from under the cabinet. Total time - almost three hours. Photo - 65 gallon tank all done on 3/18/07!! The photo does not do it justice! The tank is gorgeous! Plecy loves his new hiding place - those two fake resin rock turtle ramp things on the bottom right. Something always goes wrong. The tank cracked! 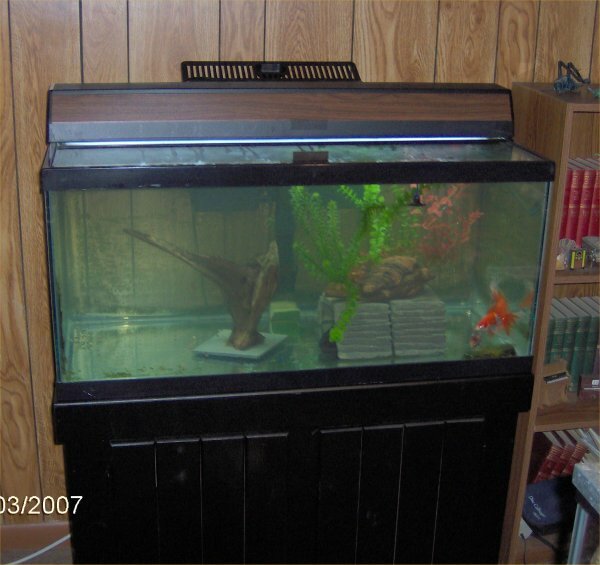 See the 65 gallon tank defect page for photos and details. 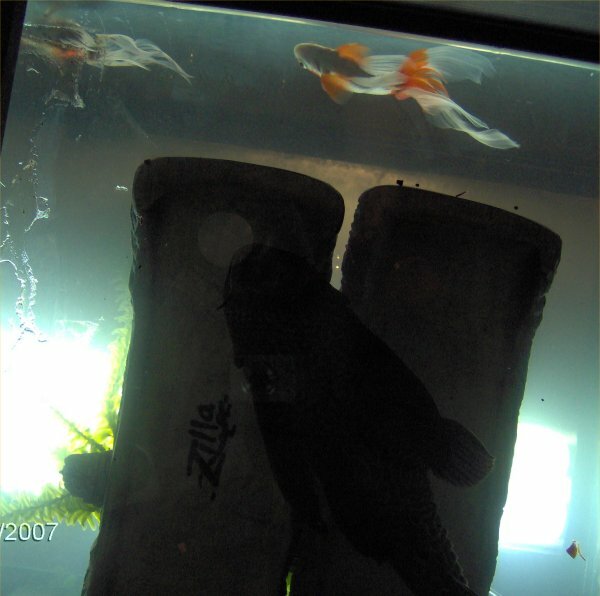 I tore the new 65 gallon tank down on 3/20/07. The fish went back to the 40 gallon with the bare essentials. We planned to get a new one 3/22/07. 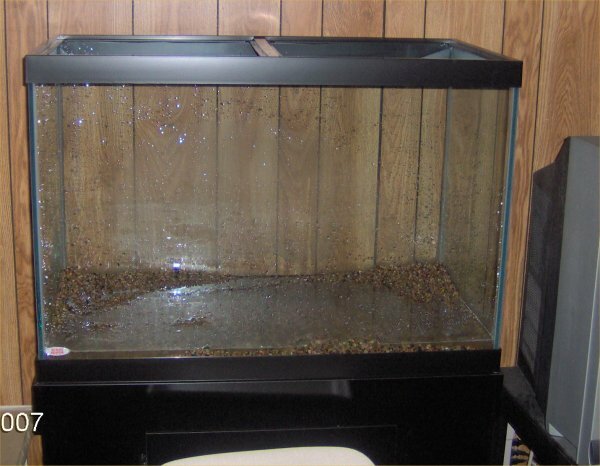 Photo - the 40 gallon tank set up again on the new stand on 3/21/07. The fish wait. Well, I took the tank back on 3/22/07. When I took the tank to the store, the guy barely looked at it. He said the cracks occurred because the tank was hit (even though there is no external evidence of that). I told him that when I set up the tank, there was just a bubble which a day later cracked (with no one touching it) on its own and that the bubble cracked after it was empty a day. He basically said, "I know someone hit it, and that's why it's cracked." We argued for 15 minutes but he refused to give me an exchange. He said he would tell All Glass the same. I wanted to strangle the guy. It is not so much about the money but I do not like being called a liar. I said I would buy another one (there are no other aquarium stores within an hour of my house that sell 65 gallon tanks). They only had one. On close inspection, I found three tiny bubbles in the silicon which I would have let slide but then two scratches on the back. He said they were silicon but when they didn't come off with a razor, he agreed they were scratches. The tank was very dusty so it had probably been in some warehouse a long time. In order to reserve a tank (possibly again imperfect), I had to buy the tank that has not even come in that may come in in a week or two. Meanwhile, my poor fish are in less-than-optimal conditions. So, I paid for two tanks and have one that is cracked. When I put the fish into the 40 gallon tank again, I did not move the gravel there but held it in buckets while waiting to get in a new tank. This day, 3/24/07, I took photos from under the tank, looking up. These show Plecy's belly as seen from below which was a unique photographic opportunity. Photo - Plecy from below. 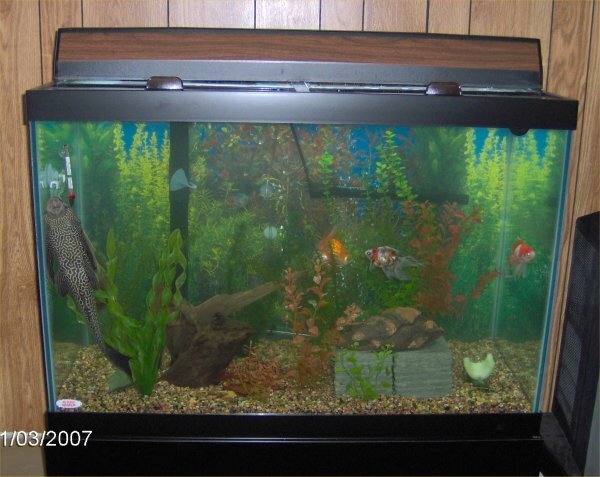 I finally set up the new 65 gallon tank on 3/31/07. Here are photos. As of 4/7/07, so far, so good. 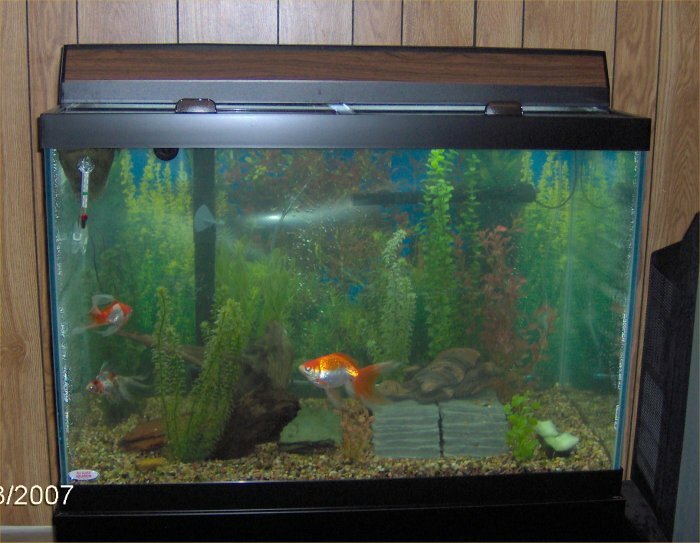 65 gallon tank - 3/31/07. 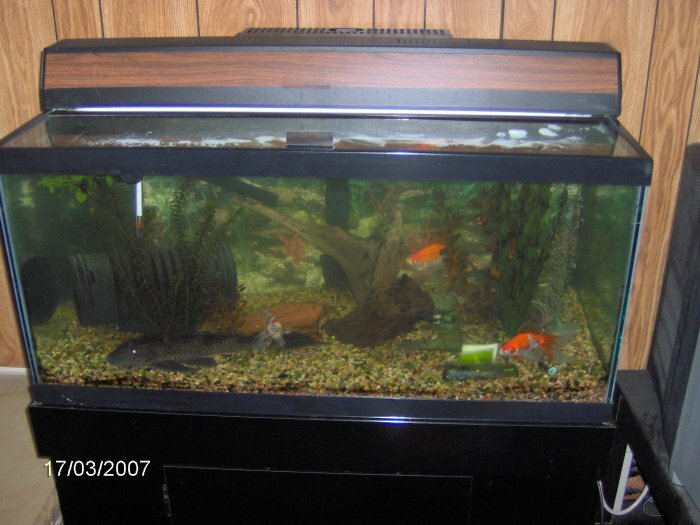 65 gallon tank - 3/31/07. Plecy was taking a gulp just as this photo was done! This caught him the moment he came down from hitting the surface so he has a bubble in his mouth. I am still trying to sell the defective tank.